It’s the last day of 2013, so I have been reflecting on how the year has gone as it relates to my genealogy research. As I think back, my year really started when I got the Exploring Our Roots & Finding Oprah’s Roots DVDs for Christmas. That was followed by a mobile handheld scanner for my birthday on January 4th. I was really excited because I had made such progress since I started in July 2012. But this year, I was determined to learn more about the process of researching genealogy and family history. January 2013 – I watched every episode on those DVDs and made notes of comments that might help me in my research. I watched some of the archived webinars on Ancestry.com. I also started organizing planning my first research trip to my hometown to gather documents and conduct interviews. February 2013 – I conducted 3 phone interviews to prepare myself for the trip I was about to embark upon. Toward the end of the month, I finally decided to order Black Roots: A Beginners Guide to Tracing the African American Family Tree by Tony Burroughs. I read parts of the book at the time, because I wanted to only review the parts that I would need for my trip. Didn’t realize at the time that I really needed to read that book cover to cover before running off on a research trip! Lesson learned. March 2013 – I went on my first week-long research trip to Mississippi to my hometown. I created a calendar and had everything planned out from visiting the cemeteries where my family was buried, the county courthouse (Clarke), the state archives (which is a 2 hour drive one-way from my parents), conducting interviews, and searching through the “family archives”. I got to interview my 94 year old cousin, who was an absolute delight! I also got to meet some people on my Dad’s side of the family who I had not previously met, even though they only lived about 15 minutes away from my parents all my life. My mom was my riding partner and she braved the cemeteries (deep in the woods of Mississippi), helped me dig in at the courthouse and the archives, sat through interviews and scanning sessions, helped me track down where funeral home records went, and contacted everyone she knew that could help me. She is still helping me now with my questions and hunting down those that are living who can answer the questions that she doesn’t have the answers to. March was an excited research month for me and I came back with lots of information for my research. To top it all off, there was the birth of my 8th grand nephew (I have 5 grand-nieces as well)! April 2013 – I started to attend genealogy seminars that were being held here in Atlanta. My first seminar was a lecture by Tony Burroughs and he signed my book! May – September 2013 – I attended more seminars and even got my feet wet in The National Archives at Atlanta. It was during these months that I realized that I was seriously unorganized! I begin to catalog, scan and file. I am still working on the organizing part (computer issues). Didn’t realize I had so much stuff. I did some research as well, adding to the pile! 🙂 I also started to join Facebook groups looking for guidance. It was through one of the groups that I was able to get the death certificate of my 2x great-grandfather, Henry Stokes, which included the names of his mother and father, taking me back another generation. October 2013 – I lost my Uncle Richard. Richard Edwards, Jr., born February 19, 1940 to Richard Edwards, Sr. and Maudie L. Sterling Edwards. He passed away October 7, 2013. We were hurt, but we know he is at rest and that we were blessed to have encountered him. I cried as I recorded the date in my tree. That was the hard part of genealogy for me. I can still hear his laugh. I am thankful that my sister and I were able to sing a joyful medley at his funeral. I also got to meet his youngest son, a first cousin that I didn’t know existed. October was hard, because my mother lost her brother and 2 cousins that month. That is 4 deaths in all for my family for the year (1 on my dad’s side a few months earlier). November 2013 – I refocused and started to research the Stokes side of my family. I conducted a couple of phone interview and tasked myself with gathering vital records again. On Thanksgiving Day, I met a cousin who added to my collection of funeral programs and even gave me a copy of a fictitious account of the lives of my Great-Granduncle Charlie Moody and Aunt Libby Stokes Moody. The book is called Paw Charlie’s Triumphs by Roy Conner. I read it a day’s time…I was that excited! I finally decided to finish reading Black Roots: A Beginners Guide to Tracing the African American Family Tree by Tony Burroughs! After I finishing that book, I also read Got Proof! by Michael Nolden Henderson in two day’s time. I love reading, can’t you tell! November was also the month that I was able to obtain the death certificate of Taylor Stokes, father of Henry Stokes. That death certificate had the name of his father, Kelly Stokes, taking me back yet another generation. December 2013 – I started to focus on how to properly document my research. My 9th grand-nephew was born! I was connected to a cousin who is the keeper of the Stokes family tree. Lastly, I joined AAGSAR and started this blog to share my research. I’d say that was an ok year in genealogy, wouldn’t you? 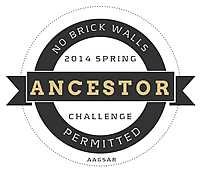 I’m pretty excited to take it to the next level and see what my ancestors will show me in 2014! Happy New Year & Happy Searching! This entry was posted in Genealogy Reflection, Stokes and tagged 2013 Year in Review, AAGSAR, African-American Genealogy, African-American Research, Clarke County, Family History, Family Tree, Genealogy, genealogy research, Henry Stokes, Kelly Stokes, Mississippi, Richard Edwards, Taylor Stokes. Bookmark the permalink. Thanks Luckie! It’s been interesting. The countdown is on to BLOGFEST! oh, i’d say that this year was MUCH more than okay! 🙂 you’ve made great strides with your research, even in the midst of losses in the family. congratulations on your work so far, and best wishes to a new year with many more discoveries! Thanks Tracey! Best wishes to you in 2014! Happy searching! I’m starting to reflect myself and see how far and all the family memories made. It’s been quite a year for me as well in 2013! I say bring it on 2014. I’m glad you documented this. Oops! Last comment was for Tracey! I was trying to use he app. Lol! Thanks True! I am thinking about documenting it every year so that I can look back and see my progress in one post. Yep! 2014 here we come! Wow, you have been busy this year! I can say that you definitely lived up to your resolution to take your genealogy to another level, and your descriptions of your activities will help others of us on the path. I guess I need to add those two books to my kindle for my upcoming retreat! Wishing you all the best in your genealogy journey in 2014, and looking forward to reading all about it in your blog. Thanks M Dawn! I am glad it is helpful. Those books are really helpful to me, and I hope that they help to advance your research as well. We will all be on the move in 2014! Happy New Year!! You have had quite a year this year. Sorry to hear about the losses you and your family had. I will say your work is well above “ok”. I was very impressed with the steps you took to learn more about genealogy. I am excited to see what the new year will bring you. Thank you for sharing your progress/steps. Job well done. May your journey be filled with many wonderful genealogy discoveries. Happy New Year. Thank you Bernita! Happy New Year & Happy Searching in 2014! Love your post! You have reinforced my goals to become more organized, to document, and take action (road trip). Yay! Go for it! The road trip was invigorating because I found so much. I am looking to plan another trip this year, but this time I will be more organized and more familiar with the repositories. Happy New Year! I can hear and see your passion on your article/post, I see it all happen through your words. I am truly happy for you!! !